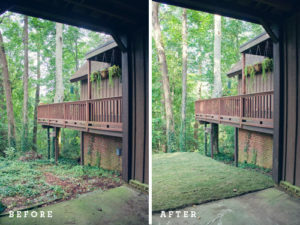 Simple Backyard Improvements to Make it Your Dream "Stay-cation" Destination! Backyard Entertainment Areas that Excite! Summers in Wisconsin are some of the most beautiful you’ll find anywhere. It’s only natural that we want to spend as much time outdoors as possible with winter lurking just months away. But you don’t have to travel to enjoy the outdoors. Your backyard is a canvas just waiting to be utilized! We have a few ideas to make it the party spot of the summer, and a true “stay-cation” destination when you need a break from it all. Take a look at your backyard, is it in shambles? If so, you’ll want to start this project by cleaning it up. That could mean removing shrubs and trees that either aren’t where you want them or they do not provide the aesthetic appeal you seek. This is a great chance for you to create the layout that will best suit your projects. It’s also a time for planting new trees or shrubs that will eventually compliment your projects or create a natural privacy wall or both. If your deck situation needs an upgrade or is nonexistent, leave it to our pros to help you design and craft the perfect deck. With their proven expertise, they can guide you to your dream outdoor entertainment area! Some of the best summer parties start with barbecues on deck, so this can be one of the most important upgrades you make. A backyard deck provides more than just an entertainment upgrade. Outdoor entertainments space can increase your home’s value and set it apart from others when a buyer is shopping. However, this does not mean that you should tailor the enhancements to what a buyer might want. Swimming pools are attractive and sometimes the center of a child’s summer plans. But if you do not swim that often, it’s a pretty expensive addition that can only be used a few months out of the year. It also might scare potential buyers away due to the level of upkeep required. Your backyard is just begging to utilized, so start planning how you would want it to look and get in touch with us about helping you craft the perfect deck to go along with it! 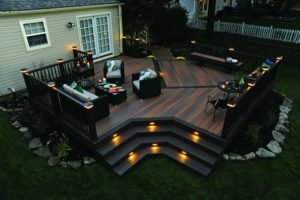 This entry was posted in Decking, Lumber, Millwork, Remodeling, Wisconsin and tagged backyard, Custom Decks, deck, decking, Wisconsin. Bookmark the permalink.